Bangladesh: when does political dissent become terrorism? One of the many fears of “anti-terrorism” laws being implemented around the world, is that they would be used to stifle freedom of expression, speech and used for political purposes against rival parties. These laws are often vague enough that the interpretation of what is terrorism, can be coerced to include what would be the legitimate grievances of the people. 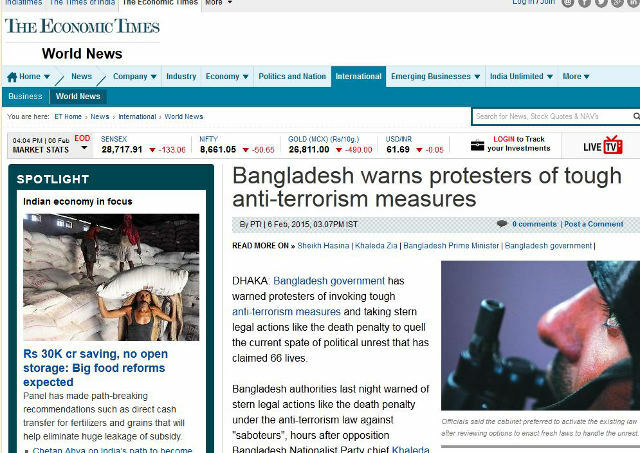 This example from Bangladesh shows how a 2009 anti-terrorism legislation could see protestors receive up to the death penalty. Bangladesh has seen ongoing political problems and related violence that has killed 66 people. But the question arises of whether arson, looting, and the deaths caused by these illegal activities are terrorism or criminal acts. Bangladesh authorities last night warned of stern legal actions like the death penalty under the anti-terrorism law against “saboteurs”, hours after opposition Bangladesh Nationalist Party chief Khaleda Zia issued a statement saying anti-government protests would continue. “I am ready to face any consequences as our backs have been pushed against the wall. We have no alternative to the movement,” she said.